collection of 30 digis and also the little collections of three available as well. They co-ordinate perfectly with the Winnie Starfish & Sandcastles collection. You can get your collections right HERE and HERE. You can use any products you like to enter as long as it follows the themes for this week. We don’t have many rules but check them out in the top bar if you need to. The winner and top 3 for week 27 Clean & Simple Challenge can be found at the bottom of this post. So let’s see what the design team have made for us - the team had to all use some kind of punch/die-cut on their makes…. 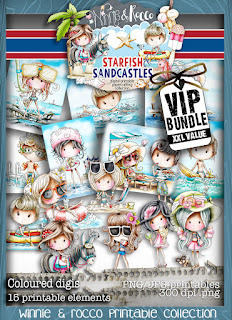 Tanya - So like Jane, I have used the Meribelle collection and the digi called Meribelle Friends which can be bought as a 3 for 2 package right HERE and the Winnie Starfish & Sandcastles collection to make my shaker card. The die cut I have used is the little seagull on top of the sentiment and the lighthouse. Hope you like it. Full details on my blog together with another little surprise too. Anjie - On this card I have used a flower from the Tropical Paradise Flamingo clear stamp set. I have stamped them out 3 times, coloured them with my Kuretake Gansai Tambi watercolour paints. I cut some fancy edge circle mats and layers using an essential Tattered Lace die set. I then layered the flowers up using 3D foam pads to give them some dimension. More details and photos on my blog. 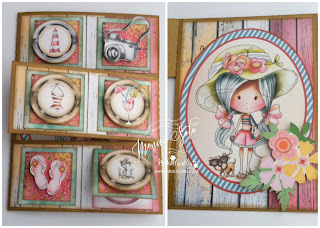 Fiki- for this week challenge I use image Winnie from Starfish/Sandcastles collection. I use ink tool to make blue background. I fussy cut this cute crab and put him on the card. Nancy: For my card I used the wonderful Winnie Fruit Punch collection. I coloured the sweet Winnie digi called Dandelion Day with Spectrum Noir Markers. 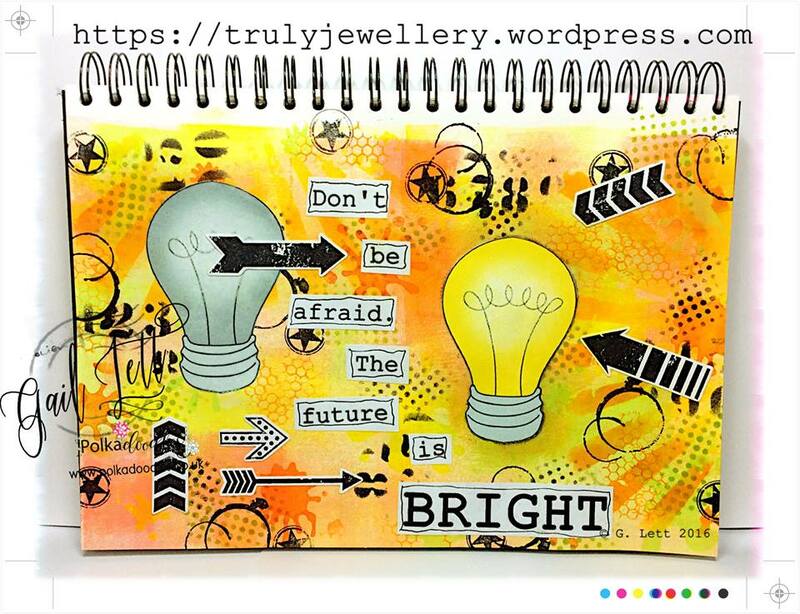 The lovely striped paper, and the sentiment, are also from the kit! I added some decorative die-cuts, and punched a border along the side of the mat behind the image. Monica.-I´m in my Christmas in July mood (I love Christmas and any excuse is good enough to start Christmas crafting). For my card I used Nativity, angels and snowflake doily cutting files from Picknix 2.-Gingerbread Twist (did you know that 35 beautiful cutting files are included in that collection). Papers and sentiment are also from Gingerbread Twist; flourishes cutting files are from Eden Collection (this collection includes 15 cutting files). Julie - I am currently in Sunny Zante, before we left I made this little wall hanging for my Son using Rocco swimming with Sharks, hopefully he won't encounter one of these in the Sea. My image is coloured with Copics. 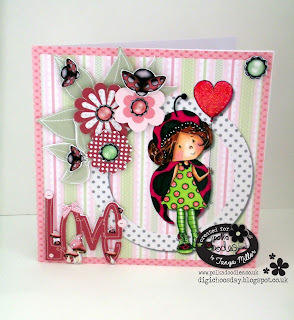 Jane P.- For this week I used a Sizziz die I have been wanting to use for my shaped card. I used Winnie in Wonderland CD collection design sheet to decorate. So, I've make a tag using a die. I've colored with alcohol markers and added some detail to make my tag more adorable!!! Gail - For this weeks challenge I've made an art journal page using the light bulb from the Science bundle kit. Or if you want the full collection you'll find it in the Work and Play 12 collection, available on CD-ROM or instant download. Please email us at sales@polkadoodles.co.uk quoting DCW027001 to claim your prize of £5 worth of downloads from the digi store! Grab your Badge from the top of the page to display on your blog. PRIZES: The random winner (chosen by Random.org) will receive £6.75 worth of downloads of your choice from the digi store! The winner and top 3 for week 26 Bling, Glitter or Gems Challenge can be found at the bottom of this post. 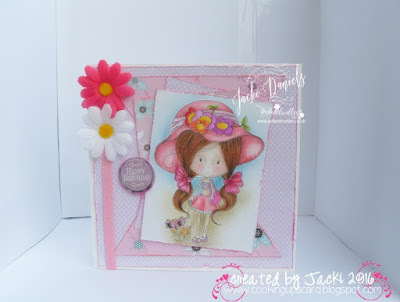 Lori - My card this week includes Winnie Sugar Sprinkles Springtime image and design sheets from the Winnie Sugar Sprinkles download collection - what a fun collection for our theme this week! 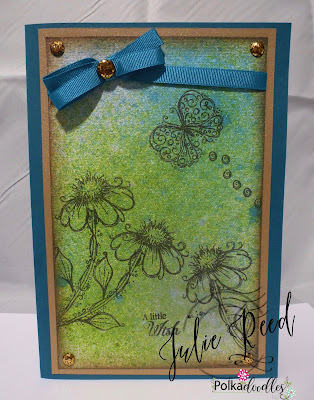 I cut out the main image, butterfly, sentiment and flowers then popped some up with dimensional foam dots for depth and added pearls to the corners and flower centers. Jacki - For my card I have used papers from the Winston collection and even made a paper by using flowers from the embellishment section over one of the existing papers. The Image is Winnie walking the dog from the new Starfish and Sandcastle download which I have coloured with polychromo and derwent coloursoft pencil. The sentiment is also from the Winston collection, flowers & ribbon from my stash. Anjie - I'm in a CAS mood still so my card today is very simple and I've used the ever so pretty Lemonade Fizz Collection. I printed the heart shaped petals and the leaves out a few times and used some distress inks to colour them. I then used some left over bits of paper from the same collection to make some pendents and mounted them onto a pearlescent card stock. 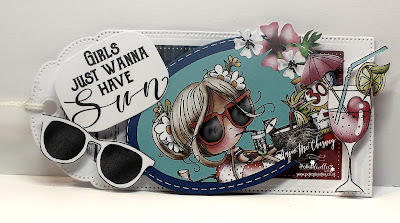 I used one of the little stamps from the Lemonade Fizz stamp set to add a few little highlights on the white background and added some faux stitching and some twine. Finally I arranged things as I wanted them and glued everything in place. And here is my make. Julie - At last some Sunshine, it's lovely seeing all my Garden in Bloom, todays card is very simple and created using the fab Daisy Days Stamps and some spray inks in Turquoise and Green, creating my paper 'Garden in Bloom'. 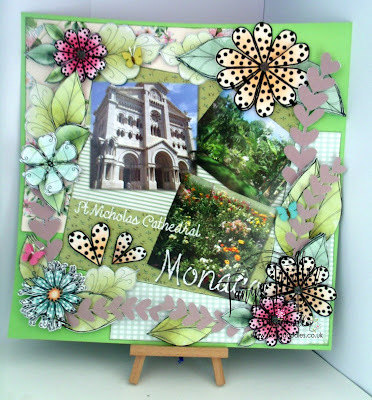 Monica-For this challenge I made a tropical garden: lush, full of green leaves and strong colours flowers. 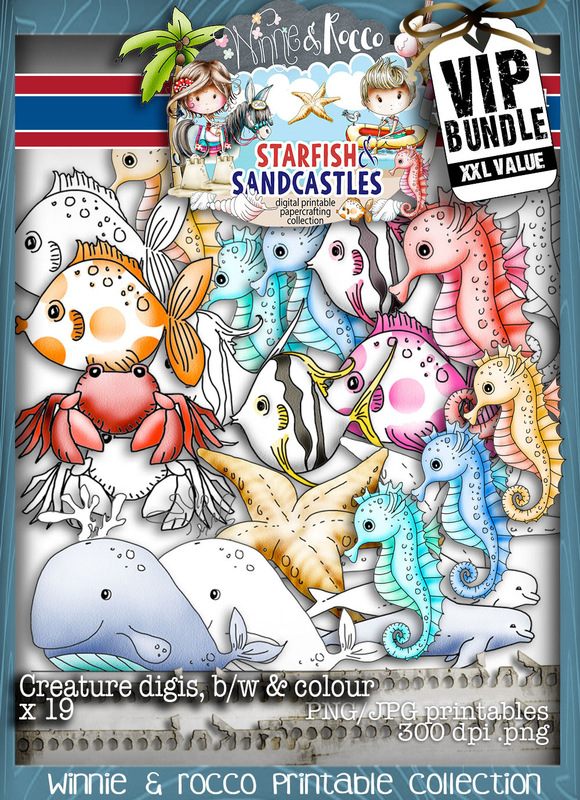 Everything in my card is from Winnie Starfish & Sandcastles. 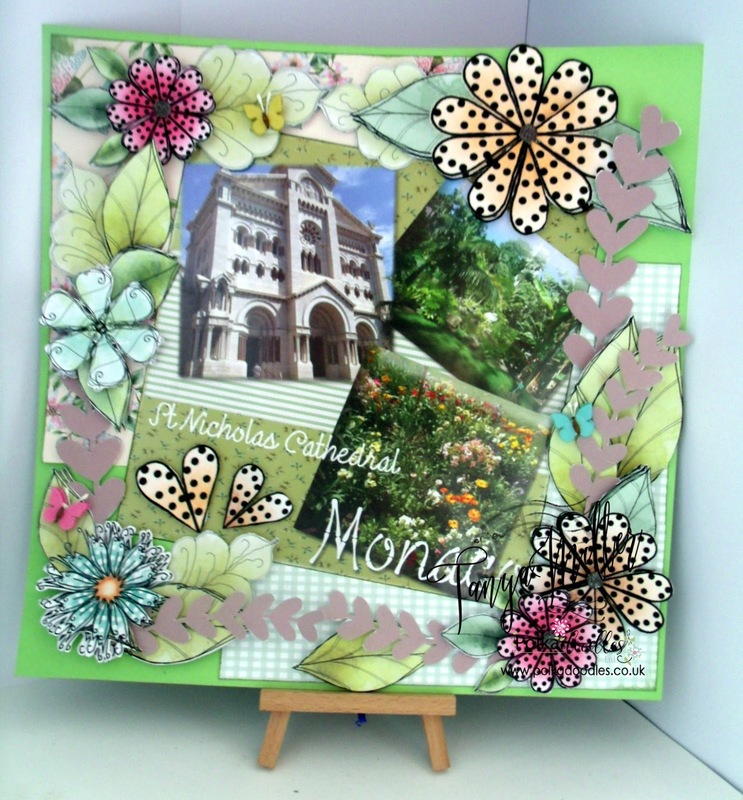 Tanya - So I've been continuing with my holiday scrapbook pages and so this week's challenge of Flowers gave me a great opportunity to use some of the photos I took of the church in Monaco and the surrounding gardens. I've used the lovely flowers and papers from the Magic Garden CD which you can get here. More pictures and details on my blog. I don't have cuttng machine so I have cut all the embellishments with scissors. More details can be found on my blog. 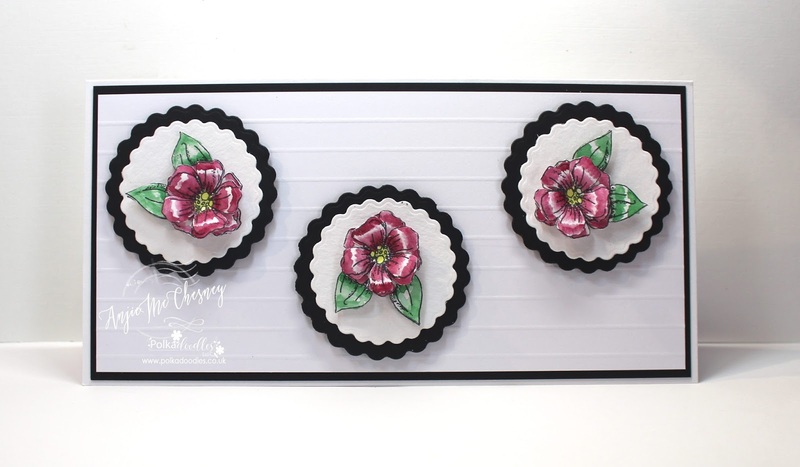 Nancy - I decorated my pre-made box using the wonderful Winnie Fruit Punch Collection. I fussy cut all the flowers from two of the full flower pages found in the florals file. I also used four of the papers to decorate the inside and outside of the box. Gail - For this weeks challenge, I've made a little decorative hanging with a chipboard heart. 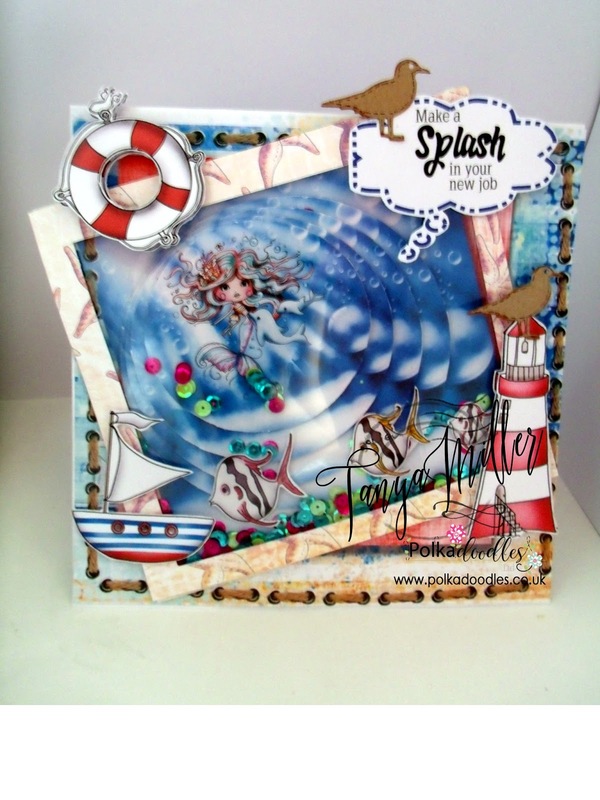 I used one of the gorgeous papers from the Winnie Starfish and Sandcastles collection, available on CD-ROM or as an instant download, together with the brand new stamp Tropical Flowers 1. 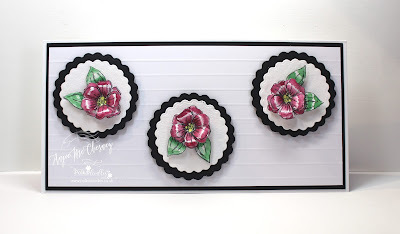 I used a stencil to create some petals in the corner with distress ink. For my coloring I used alcohol markers, I don't know why but I want to used green on her hair... I love the result! Great makes from the DT, I’m sure you will agree, we have some great ideas for you this week! Please email us at sales@polkadoodles.co.uk quoting DCW026001 to claim your prize of £5 worth of downloads from the digi store! 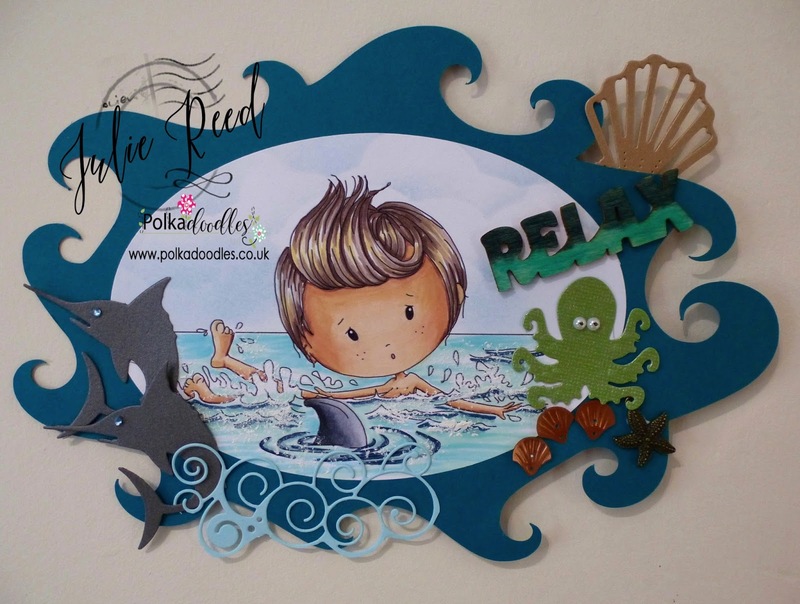 The Winnie & Rocco Starfish and Sandcastles is still available from the website and you can get your collection right HERE…. 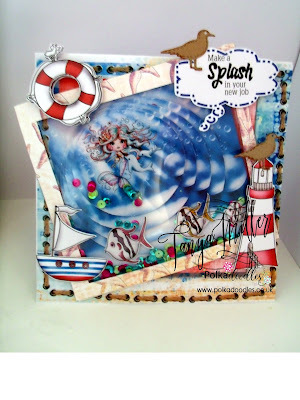 This is an incredible Nautical, Beach themed collection perfect for the Summer - make truly uplifting projects for all year round with some great themes and sentiments. The winner and top 3 for week 25 Add Ribbon Or Twine Challenge can be found at the bottom of this post. 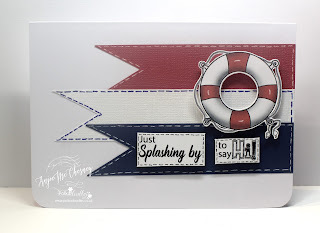 Anjie - This week I have made a tag from the left over bits of one of the design sheets from the fab Winnie Starfish and Sandcastles collection. It is from design sheet 1. There are so many bits on those design sheets, I still had left over bits after making the card and the tag! All I added extra was the sentiment. More info and photos of the card I made on my blog. Julie - So I finally got some time to play with the Fab new Winnie Starfish and Sandcastles collection, I have hand coloured the image with Copics & Graph It markers and created the sky with inks and ink dusters, hopefully this will be me it two weeks time as I head off to the sunny Greek island of Zante. Gail - Morning all, I've made a bookmark, I've been using receipts and scraps of paper so it was time to make myself a decent bookmark! The bookmark was made using pre-coloured elements from the lush Winnie In Wonderland collection, available on CD-ROM or as an instant download. 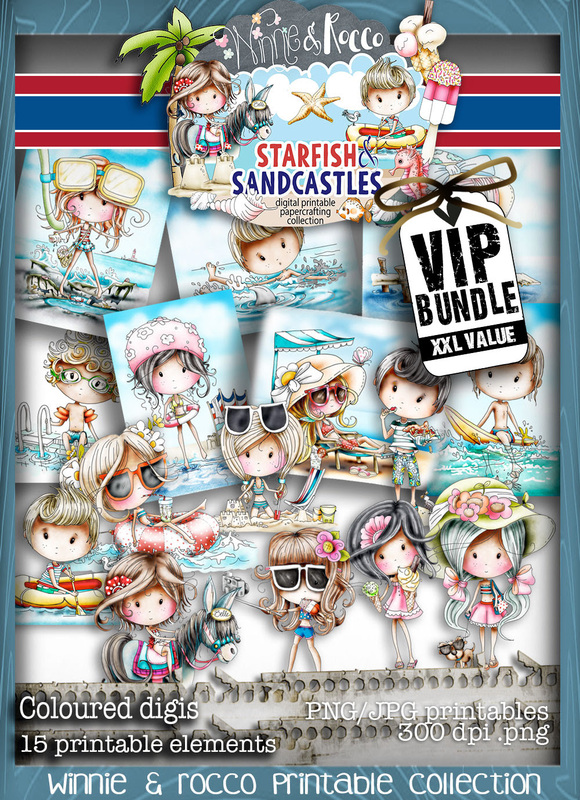 Monica- As you can see, we are in love with the new Winnie Starfish & Sandcastles!!! I used different items from its designs sheets to make a fun fold squares card. If you want to know what girls want, take a look into my blog. 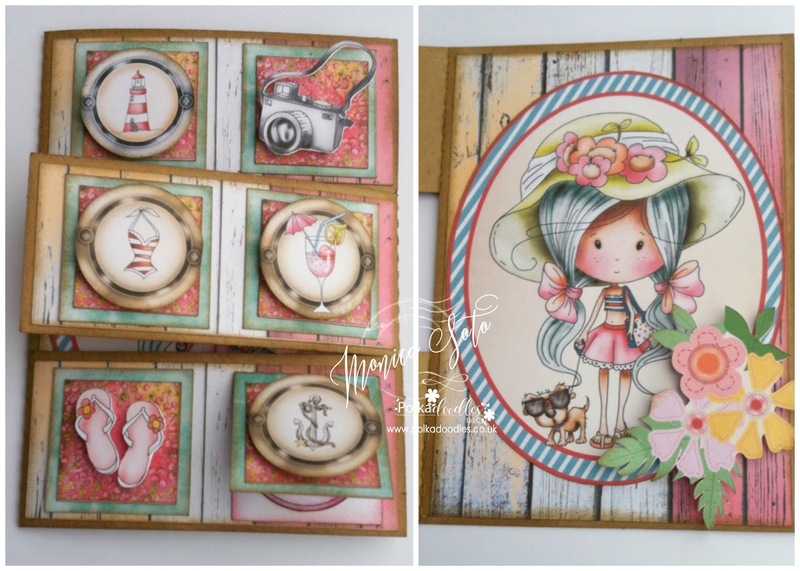 Tanya - So for this week's make I have used the Lily Bug Love Collection to make a large 8x8 card. Every element is from the collection and I have coloured the digi using my Graph It Pens. Full details over on my blog. 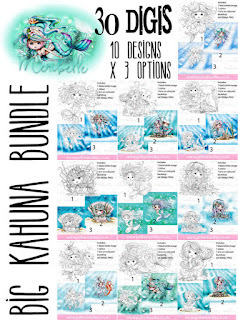 Fikreta - For my make this week I have chosen to use one of the design sheets from Winnie Fruit Punch Collection which you can get here and the design sheet can be bought here on its own. 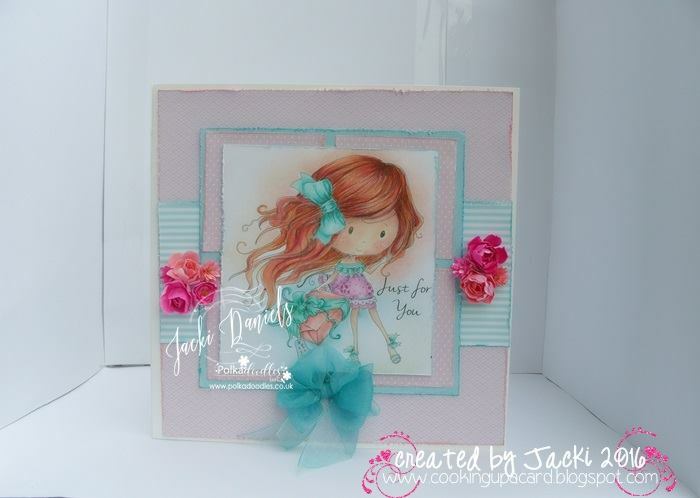 Jacki - For this card I have used images papers and images and elements from the Winnie in Wonderland Big Kahuna Download Collection available HERE . The papers have been distressed then inked with distress inks. The images have been merged together layering them together over one of the tags then printed out and coloured with polychromos and luminance pencils. The sentiment is also from this collection together with the drink me that I added to a small tag and then added to a bottle. The stalk is from the embellishment section and has been fussy cut out and added to the card everything else is from my stash. I created my backround with distress ink and put on my cups glossy accent. It' was so easy and fun! 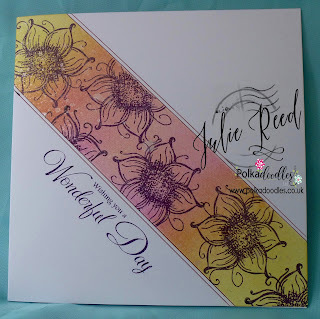 Jane P - This week I tried something different with the design sheets on the Winnie Fruit Punch collection CD. I used the background paper and cut it out making it a frame for the image! You can get the collection here on Download and here on CD. Please email us at sales@polkadoodles.co.uk quoting DCW025001 to claim your prize of £5 worth of downloads from the digi store! We do hope you saw the new release over the weekend…. Winnie & Rocco Starfish and Sandcastles. You can get your collection right HERE…. Winnie is our most popular character ever, so we've pulled out all the stops to bring you more Winnie adventures together with her brand new Beau.....ROCCO! And he's just as cute as she is! The winner and top 3 for week 24 Just For Men Challenge can be found at the bottom of this post. Gail - Clean and simple is not my go to style as a rule, I'm a messy crafter and more is more with my usual crafting style lol but I have to say I'm rather pleased how this turned. I used the truly fab Scientist from the Work and Play 12 collection. All the elements used are from the Science bundle available as instant download here but if you fancy the whole collection you can purchase Work and Play 12 on CD-ROM or as an instant download. Fikreta - For my clean and simple card I have used the mailbox image from Winston series. Jane P - For my clean and simple make this week I have used the pre-coloured Dance Star from Winnie Fruit Punch Collection. Nancy - From the Winnie Sugar Sprinkles Fruit Punch Collection I used this sweet black & white image and coloured it with my Spectrum Noir Markers. Then I used a paper, flower tag and sentiment from the collection to finish my CAS card! 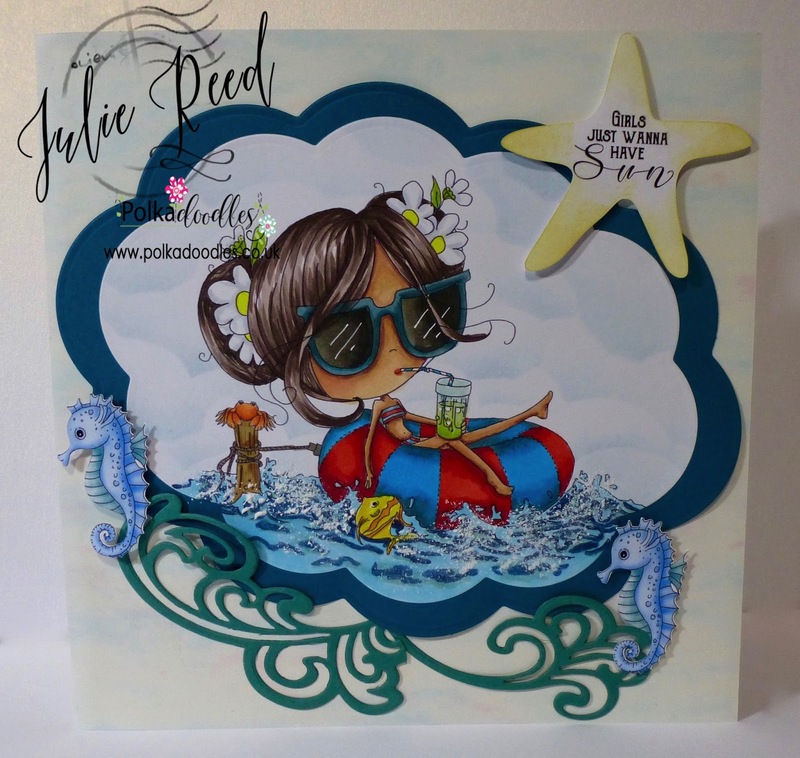 Julie - It was really nice to try a CAS make, so out of my comfort zone, but made super easy with the new Stamp Me stamps - I have used a stamp from the Summertime collection with Adirondack inks. 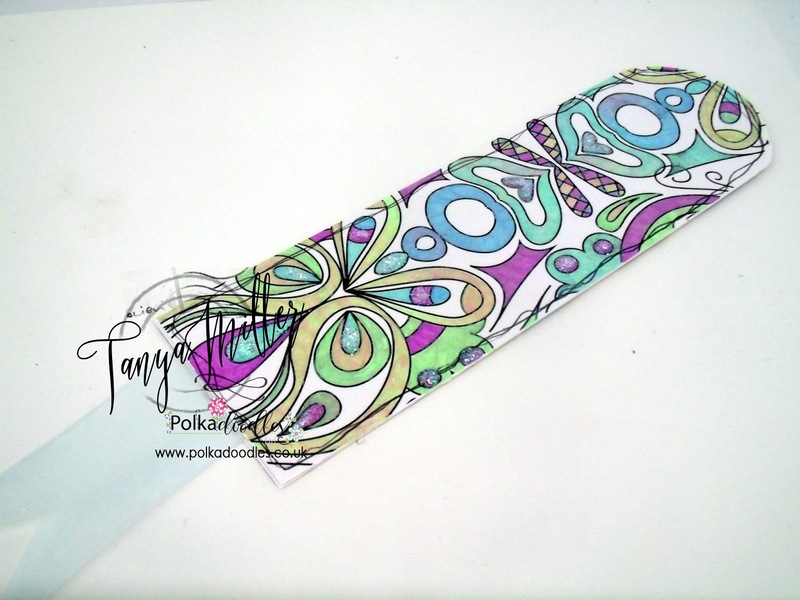 Tanya - For this week's challenge I've made a bookmark using one of the pages from the adult colouring collection called Colour Therapy Florabunda which I've coloured with some pastel gel pens and covered with touches of glitter and a bit of ribbon. More details on my blog. 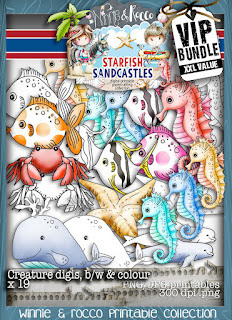 Anjie - For my make I have used the fab new Winnie Starfish and Sandcastles collection too. I have used an embellie and a sentiment from the collection and used a few strips of card from my scrap box. I added faux stitching around the edges of the card strip and the sentiment which I split into two. I then fussy cut the life preserver and mounted it onto 3D foam and there you have it, a very CAS. 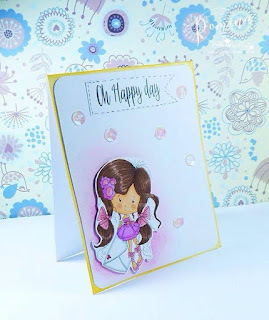 Romina - This week my clean and simple style uses distress ink to make my background and some added sequins. I just love this digi which is called Winnie Wishes which you can get HERE. More photos and details can be found on my blog. Please email us at sales@polkadoodles.co.uk quoting DCW024001 to claim your prize of £5 worth of downloads from the digi store!